This one day accredited conference will provide a clinical and research update on the important new geriatric syndrome of sarcopenia. Sarcopenia is the loss of skeletal muscle mass and function with advancing age and there is increasing recognition that it is central to frailty, disability, morbidity and mortality in older people as well as increasing use of health and social care. It is the focus of intense research activity both in terms of understanding aetiology and developing interventions and there has been considerable recent progress in how sarcopenia should be defined. Yet to date, it is clear that recognition of sarcopenia in the clinical setting lags behind. This conference aims to provide clinicians and researchers with an update on recent developments in understanding the aetiology of sarcopenia together with practical approaches for its diagnosis and management in clinical practice. The organizing committee at Medineo is pleased to invite you to submit abstracts for a poster presentation at our Sarcopenia 2013 conference (Posters on previously presented work are welcome). Abstracts will be selected on a "first come first serve" basis. Deadline for abstract submission is the 31st of May 2013. All abstracts must be submitted and presented in English and should not be longer than 300 words. Enter the full name of your abstract exactly as it appears in your abstract document. This will be used for printing in the final programme. Author's, whose abstracts are accepted, must attend the meeting and present in person. Abstracts are to be presented as a poster. The size of the poster should be 90 x 120 cm. Ideally, each poster will be self-explanatory, but there will be various sessions where presenting authors are expected to be available near their poster to answer questions and engage in discussions. 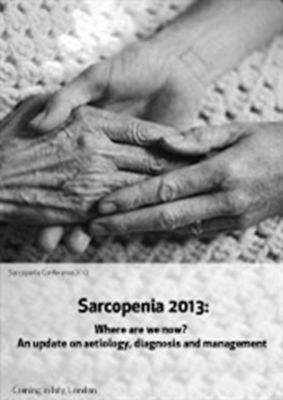 Chairman's welcome and presentation on: Overview - why is sarcopenia important? Biological mechanisms – what is the role of oxidative damage and denervation? Biological mechanisms – is mitochondrial dysfunction involved? Treating sarcopenia – where are we with exercise interventions? Treating sarcopenia – where are we with diet interventions? Treating sarcopenia – where are we with drug treatment?